Aesthetic Behavior; Developmental Sequences, is a collaboration by Gabo Camnitzer and Lluís Alexandre Casanovas Blanco, that uses the avatar of the child to reflect upon current modes of spectatorship and subjectivity. The project engages with the analysis of perception and knowledge acquisition as codified by child psychology, subverting the ways this field has denied agency to their research subjects through process of objectification, individualization, and ultimately, essentialization. In the gallery, Aesthetic Behavior; Developmental Sequences manifests as a repertoire of objects and props which rethink procedures and instruments drawn from the history of child psychology. 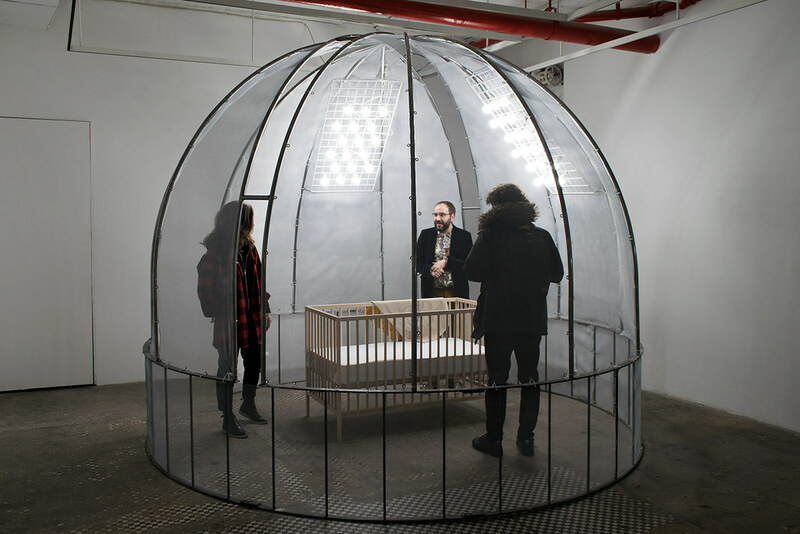 Amongst them, stands out a recreation of the observation dome designed by Arnold Gesell for his experiments on babies at Yale University during the early 20th Century. These props, situated at the intersection of surveillance mechanisms, tools for documentation, and clinical devices, sought to reduce experience and learning into mappable numbers. The props and instruments will be activated through a series of performative workshops with children from local schools. The children will be engaged in a dialogue about the history of child psychology and tasked with developing new modes of experimental research using the objects on an adult test subject. These workshops invert the power asymmetry permeating much of these studies by subjecting an adult’s experience to the disciplinary gaze of children. The recursion of experiment within an experiment complicates take-for-granted narratives, themes, and ideas in child psychology by making visible and public the dilemmas and ethical difficulties one faces when measuring, and reducing to quantifiable numbers, the qualities of the human being—young and mature alike. Gabo Camnitzer is an artist and educator whose artistic production is centered on subverting the reductiveness of the dominant epistemological order though fostering in viewers and participants an ability to inhabit contradiction and account for difference. He has presented projects at Queens Museum, Tenthaus, Oslo, GfZK, Leipzig; Artists Space, New York; Bonniers Konsthall, Stockholm; GCAC Melbourne; Kunstsaele, Berlin. He received an MFA from Valand Academy, Sweden, attended the Whitney Independent Study Program, and received a research fellowship from The Royal Institute of Art, Stockholm, Sweden. He is an Assistant Professor of Visual Art at Columbia University, New York. Lluís Alexandre Casanovas Blanco is an architect, curator and scholar working at the intersection of architecture, performance, and media. His recent work addresses the capacity in which spatial experience is coded by institutional power—with a specific interest in spatial discourses which oppose modern rationalization. He was the chief curator of the Oslo Architecture Triennale 2016 together with the After Belonging Agency, and he is currently a PhD Candidate at Princeton University, and a Critical Studies Helena Rubinstein Fellow 2017–18 at the Whitney ISP.